An ex-refugee who campaigns for mental health issues is firing Australia’s campaign at the Asian Cup — and may yet lead his adopted nation to their greatest football triumph. 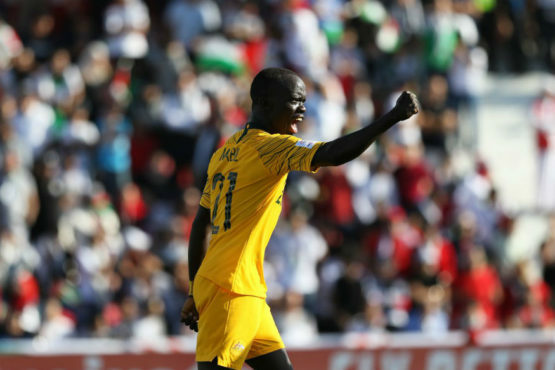 Far from the average footballer, Awer Mabil spent his childhood in a mud hut as a refugee from conflict in Sudan, but after moving to Australia he has risen to become one of the country’s most important players. Mabil, 23, scored on his Socceroos debut in October and he has already bagged two goals in three games at the Asian Cup in UAE, including a glorious, curling strike with his weaker left foot in the 3-2 win over Syria. He greeted that goal, as always, with a distinctive celebration of his own invention — covering his mouth with one hand, with two fingers from the other hand pointing at his forehead, signifying the need to open up about mental problems. “It’s for people suffering from mental problems or depression. It’s trying to create awareness for them and bring peace to their mind,” Mabil told AFP. It’s a highly unusual topic for a player to discuss at an important tournament, but it’s a subject that’s close to Mabil’s heart after witnessing mental problems “all over the world”. “It’s something that I keep in mind because I know a lot of people suffer from it. The sport we play, we’re very grateful but it’s not easy, it’s not what people think it is,” he said. He added: “I’m a person for the people and I want to make sure that the people are okay. Mabil also founded the Barefoot to Boots charity for people living in refugee camps, further demonstrating an altruistic streak which he says he owes to his mother. “I think the way my mum raised me in terms of the values that she put into me, she’s a single mother and she’s taught us a lot,” he said. Mabil was born in Kenya’s Kakuma refugee camp after his parents fled Sudan, surviving on one meal a day as a child and kicking a ball around to pass the time. But after being resettled in Australia in 2006, he developed his football enough to join Adelaide United as a teenager and then moved to Denmark’s FC Midtjylland, surviving two loan spells before nailing down a regular spot this season. The right winger has seized his Socceroos opportunity with both hands, quickly becoming a starter under Graham Arnold — and he now has high hopes of securing a second straight Asian Cup title for Australia, and their first away from home. “It’s an amazing team to be part of, the coaching staff, the players. It’s such a good environment,” he said. Mabil said he was confident Australia would be in the final in Abu Dhabi on February 1, for which he planned to fly over his mother, who is visiting family in Sudan. “I’m not sure if they’ve got television in the village. I call her now and then and she sees things on Facebook and stuff like that. I’ll call her tonight,” he smiled. “For the final I’m planning to fly them over. That’s the plan,” added Mabil.